April is Earth Month! What goes down our drains ends up in our oceans, so one of the easiest ways to lighten the weight of your footprint on the planet is to embrace green cleaning products in your home. Ingredients listed on cleaning products can be daunting to decipher, but it's well worth paying attention to them! We have a great selection of green products at Pomme that we've carefully researched, and love. It's also super simple to whip up batches of your own homemade products using a set of core ingredients you may well already have on hand! Castile soap: a gentle, all-purpose foaming cleaner that makes a great base for your DIY products. The amazing people over at the David Suzuki Foundation have put together a super useful PDF with cleaning product 'recipes', which you can download here. We've copied one of their recipes below, just to give you a taste of how easy this really is! For toilet: sprinkle onto surface, scrub, and chase with vinegar. For dishwasher: add dry ingredients to soap dispenser and vinegar to rinse dispenser. And if and when you're making the transition to a green cleaning household, don't forget that it's important to dispose of the chemical products you have on hand as responsibly as possible! They'll cause harm in a general landfill, and many communities have dedicated centres for the disposal of toxics & electronics recycling who can take toxic cleaners off your hands. We hope everyone has an amazing Earth Month! 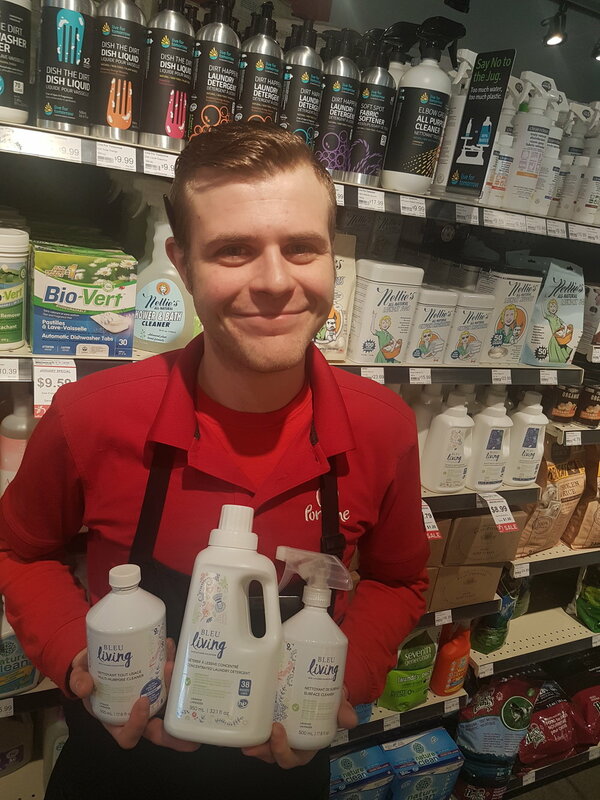 Our Gentleman Grocer Bernhardt, in Pomme Nanaimo's green cleaning aisle!